On this journey we take travelers into the heart of Qinghai's most sacred places - hidden monasteries and centuries-old stupas locked deep inside bald mountains and remote valleys, where the best Tibetan art and simple Tibetan villages and people can also be found. A historical and cultural city with its nicely preserved Longwu Temple, a showcase of traditional Tibetan religious art. 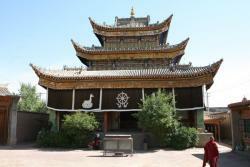 The 1,000 year old Wutun village near Tongren has the well-known Upper and Lower Wudun monasteries. It features an organic tapestry of village and monastery, laymen habitat, as well as monk residents. The Tibetans here have a rich history recorders through murals, tangka and statues that abound in this area. The art school in the monastery, which was set up in the 16th century, is known for its craftsmanship and fancy colors and enjoys wide-spread fame across the Tibetan region till this day. 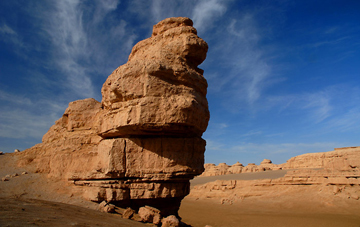 Qinghai's natural beauty will also be appreciated in the Kanbla National Forest, a remote landscape of red sandstone peaks and meandering yellow rivers; and in the Nanzong Valley, locked in between danxia peaks and dense forest lines. Nestled in the valley, Nanzong Buddhist Nunnery and Temple are the only religious Buddhist places with monks and nuns coexist with each other in Qinghai Province China. Although the monastery is historically important, you may still skip it if you visit Tongren. Because you will see quite some similar monasteries in Tongren and Kanbula, which are much more authentic, peaceful and much less tourists. In addition, Kumbum is located on the west of Xining, which is opposite direction of this traveling route and takes another half day to do it. Gansu is a province located in the northwest of the People's Republic of China. It lies between Qinghai, Inner Mongolia, and the Huangtu plateaus, and borders Mongolia to the north and Xinjiang to the west. The Yellow River passes the southern part of the province. Gannan (South Gansu) is the Tibetan Autonomous Prefecture, where Lanzhou & Xiahe are located. 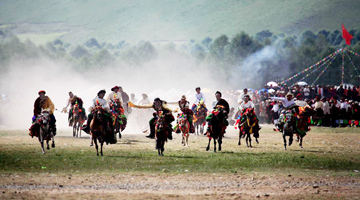 The famous attractions are Labrang Monastery and Langmu Monastery. 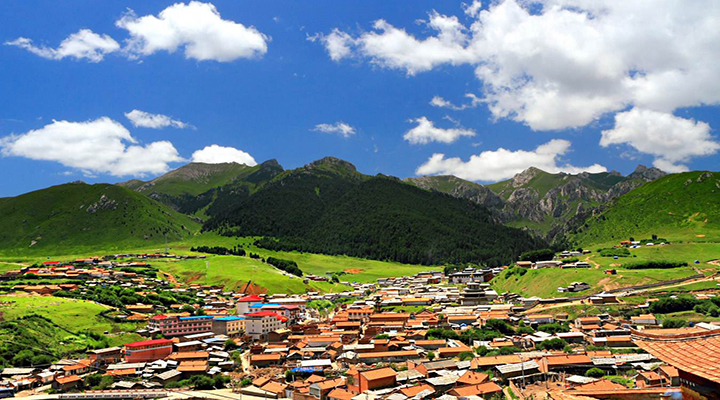 is a tiny, bustling town nestles in a mountain valley at an elevation of 2,900m in Ganan Tibetan Autonomous Prefecture, southwest Gansu. The town was divided into two sections, primarily Hui (Muslim) and Han Chinese at its eastern end, changing abruptly to a Tibetan town as you climb westward to the gorgeous gilded roofs of the vast Labrang Monastery. Bent and walnut-visaged Tibetan pilgrims make you welcome on the 3km circuit around the monastery's perimeter. It is not just the amazing sights of the Labrang Monastery and the Sangke Grassland that will enamour you with Xiahe, but also the vibrant atmosphere. The locals and nomads in the village live a laid-back lifestyle. The population here is made up of 45% Tibetan, 45% Han and 10% Hui, making this a good place to behold monks in bright purple, yellow and red, nomads clad in sheepskins, and the Hui Muslims with skull caps and wispy beards. The town is also a thoroughfare for inbound pilgrims from Qinghai and Tibet. Located in the southern part of Gansu, part of the traditional Tibetan province of Amdo. It is one of the six major monasteries of the Gelukpa tradition of Tibetan Buddhism in Tibet, and the most important one in Amdo. Built in 1710, it is headed by the Jamyang-zhaypa. It has 6 dratsang (colleges), and houses over sixty thousand religious texts and other works of literature as well as other cultural artifacts. In Langmu, in the south of Gansu, there is a monastery which is divided into two parts by the Bailongjiang River, one half belonging to Sichuan and the other to Gansu. It has two Tibetan monasteries and two schools. The Tibetans who live in Langmu Monastery share the living habits in daily life and often also the religious activities. Langmu means “fairy” in Tibetan language. The Monastery got its name because inside the cave there is a rock bearing the resemblance of a beautiful young lady which was believed to be a transformation of a fairy. Langmusi is an ideal destination for the backpackers, quiet and picturesque. 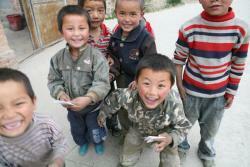 * Authentic Tibetan, Hui and other ethnic townships and villages and people. 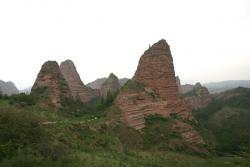 * Stunning landscapes of Danxia Red Peaks and forest, lakes, Tibetan pastures, valley and monasteries on the peaks. * Beautiful Tibetan Architecture and traditional religious art. 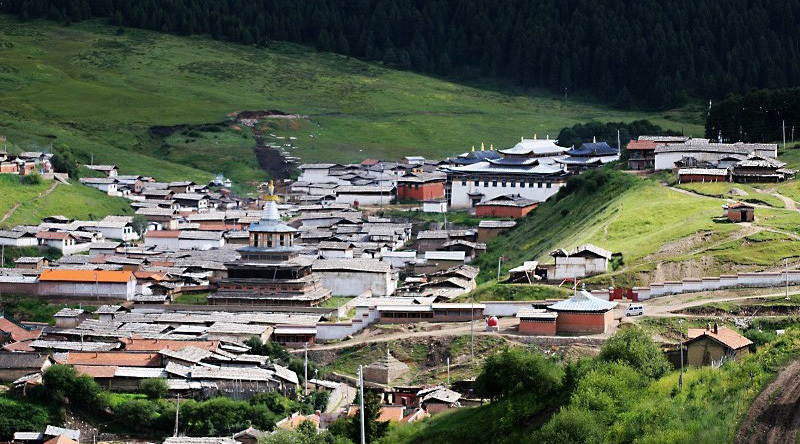 * Enjoy the peace and ease of picturesque paradise -- Langmu Monastery and village nestled in the Tibetan mountains. Arrive in Xining, capital of Qinghai Province. Have lunch. 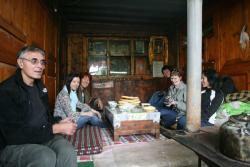 Drive to Tongren and stay overnight in Tongren. This morning we go on a pilgrimage walk along with the local monks to the Longwu Temple and then walk around the monastery to find opportunities to engage with monks to discuss about their daily rituals. 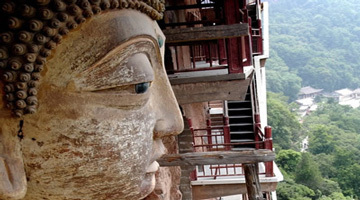 We continue to explore the Wutun, a 1,000 year old village with the well-known Upper and Lower Wudun monasteries. It features an organic tapestry of village and monastery, laymen habitat, as well as monk residents. The Tibetans here have a rich history recorders through murals, tangka and statues that abound in this area. The art school in the monastery, which was set up in the 16th century, is known for its craftsmanship and fancy colors and enjoys wide-spread fame across the Tibetan region till this day. 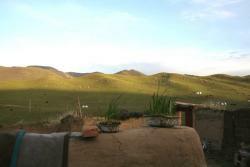 Drive 3.5 hours to Xiahe. Visit the stunning Labrang Monastery. Located at the foot of Phoenix Mountain, Labrang Monastery is one of the great six monasteries of Gelukpa sect as well as the location of Gansu Provincial Buddhism College. Unlike many other Chinese temples or monasteries, it has no bounding walls. The locals can enter or exit the monastery very conveniently. Its inside seems a little dark. Lighted butter lamps are put here and there. 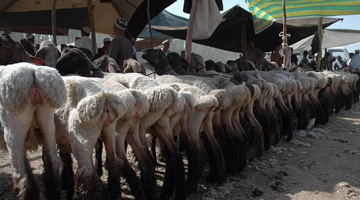 Lamas sit together and recite the Buddhist scriptures. Observing carefully, you can find that even if the locals pass by the monastery, they will bend the body to worship very piously. From this, you can understand how holy religion is in Tibetans' mind. After lunch, head to Langmu Monastery before the dusk. Stroll in the town and try their yak meat burger and apple pie (optional) in the coffee shop. Stay overnight in a 3 star hotel near the Langmu Si. (the best available in the area. A bit damp because of the local weather). Labrang monastery nearby Xiahe, the most important religious centre on the northeast border of the Tibet region. The monastery created in 1710, as one of the six grand monasteries in Tibet area, has served for centuries there to connect the Tibetan and Mongolian Lamaism. Get up in the morning to mount on a hill for sunrise and visit the monastery for the monk's debate. In the afternoon, you can take a light hiking in the valley and appreciate the snow mountain in the valley. Drive to Lanzhou. Along the way, stop by a lake and view the birds. Arrive in Lanzhou and transfer to the airport. Fly back to Beijing. Please note that the flights or timing of flights mentioned in the above itinerary may change subject to ticket availability and airline scheduling. Alternative hotels of similar standards will be used if any of the hotels mentioned in the itinerary is unable to provide enough accommodation.